Khabib Nurmagomedov is sticking by his teammate. The UFC lightweight champion is furious about the entire matter that has spiraled out of control from UFC 229. Following “The Eagle’s” victory over Conor McGregor, a huge team vs. team brawl ensued. McGregor teammate Dillon Danis antagonized Khabib from cageside during the fight. Afterward, Khabib jumped the cage and attacked Danis. This led to a brawl breaking out inside and outside the cage. A few of Khabib’s teammates even attacked McGregor inside the cage. At least one of those men were under contract with the UFC. President Dana White said after the event that they’ll never fight under his promotion’s banner again. “I would like to address @ufc. Why didn’t you fire anyone when their team attacked the bus and injured a couple of people? They could have killed someone there, why no one says anything about insulting my homeland, religion, nation, family? “In any case, punish me, @zubairatukhugovhas nothing to do with that. 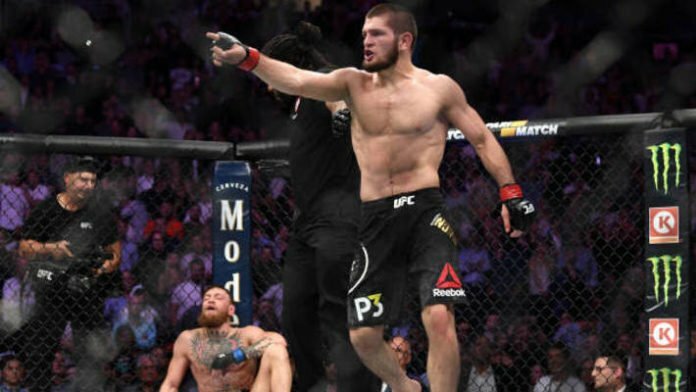 What do you make of Khabib’s message to the UFC?